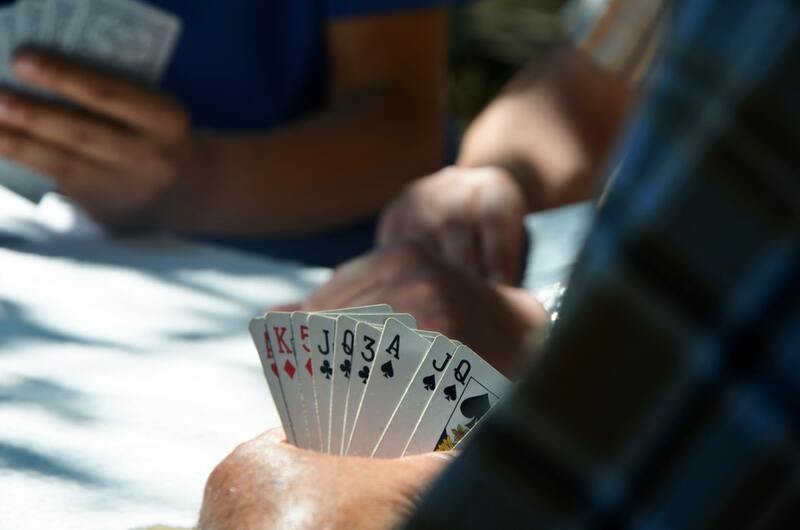 The Euchre card game is a four-player card game that has been around for centuries. First introduced to the United States by German settlers in Pennsylvania, it has gained popularity throughout the country and beyond. A Euchre card game is played by four players in teams of two. Each round, players take turns laying down one card intending to take a "trick,". Playing the highest-ranking card for that round and getting a point for their team. Playing a Euchre card game can seem daunting at first. But once you've learned the rules and figured out the basic strategies, it becomes a fun and often fast-paced game. All you need to start your Euchre card game is a standard deck of playing cards. And a group of four players. To start the game, you'll remove all of the cards between two and six. Keeping the Ace, King, Queen, Jack, 10, 9, 8, and 7 of each suit for play. Often players will use the five cards to keep track of scoring. Players will sit facing each other (a square table is ideal but not necessary). The person sitting directly across from you will be your partner, and the two of you will share your score. The goal of the game is to be the first team to reach 10 points by taking tricks. Each round, the team that collectively takes the most tricks wins that round. It is assigned points based on a few factors that will be covered later. As there are five possible tricks in each round. A team needs to take three tricks or more in order to score that round. Since the game is played by teams, this means that if your partner takes one trick and you take two. Your team has won that round. 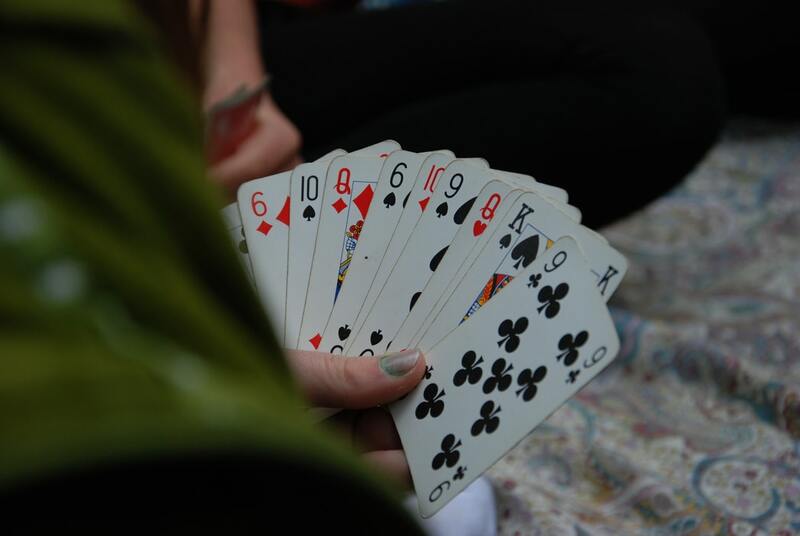 The values of the cards follow the traditional ranks, with the Ace being the highest, followed by the King, Queen, Jack, 10, 9, 8, and then 7. But there's one very important caveat. Each round, a suit will be declared the "trump" suit. The Jack of the Trump suit has the highest ranking of all, And the Jack of the other suit of the same color has the second-highest rank. These Jacks are referred to as "bowers" with the Jack of the Trump suit being the right bower. And the Jack of the other suit of the same color being the left bower. This will become clearer as the Euchre card game progresses. This means that if diamonds are trump, and the Jack of Diamonds is the highest ranking card, the Jack of Hearts is the second-highest (and the Jack of Hearts is considered a diamond for that round). From there the standard ranks follow Ace, King, Queen, 10, 9, 8, 7. The game starts by determining who will deal first. Typically this is done by having each player draw a card, and whoever draws the lowest card deals first. Other variations are acceptable. The dealer shuffles the deck, allows the player to their right to cut, and then deals five cards to each player in groups of two or three cards - that is, the dealer can deal three cards to each player, then two cards to each player, or vice versa. Once each player has their five cards, four cards will be left face-down on the table. The top card is turned face-up. Starting with the player to the left of the dealer, each player can decide whether they want the revealing suit to be trump or pass the decision to the next player. And if any player decides the face-up suit will be trump, the dealer may pick up that card to add to their hand, then discard one of their cards face-down onto the deck on the table. When a player declares trump--whether by accepting the face-up suit or deciding on one of the remaining suits--that player has the opportunity to declare that they are going to "Go Alone." This means that that player's partner will sit out this round and can't contribute to any cards to the round. This presents the player who is going along with the opportunity for more points but also makes it more difficult to win the round. Once the trump suit has been decided, the round begins. The player to the dealer's left plays a card face-up on the table. The next player, going clockwise, lays down the next card, and so on until each player has played a card. Every player must play the same suit as the first card played for that round if they have any cards of that suit. Otherwise, the player can play any suit they wish. Once all the cards have been played, the player with the highest-ranking card of the suit played wins the trick--unless someone has played a card of the trump suit. Diamonds were called as trump. The first person plays the King of Spades. If the next cards played are the Eight of Spades, the Ace of Hearts, and the Jack of Spades, the first player--the one who played the King of Spades--wins the trick for their team. The Ace of Hearts doesn't count because it's not the suit that was led and it's not trump. However, if the first player leads with the King of Spades, and the next cards played are the Eight of Spades, the Ace of Hearts, and the Nine of Diamonds, the Nine of Diamonds wins. This is because the trump suit always beats the suit led. In the same scenario where Diamonds are trump, let's say the first player leads with the King of Spades, the next player plays the Ace of Hearts, next is the King of Diamonds (the trump suit!) and next is the Jack of Hearts. Who wins the trick in this scenario? Remember that the Jack of Hearts is considered a diamond since it is the same color as the trump suit. It also beats the King of Diamonds since the ranking in the trump suit is Right Bower (Jack of Diamonds), Left Bower (Jack of Hearts), Ace, King, Queen, 10, 9, 8, 7. So why not always play the trump suit in order to take the trick? Well, let's say Spades are led in the first hand. You play a Diamond (which was made trump) and take the trick. The next round, you play a Spade. When another player notices that you have Spade that you were required to play on the previous hand but didn't. They will declare that you have "reneged". This will end the hand, and the other team will be awarded four points. Scoring depends on which team called trump and how many tricks the winning team took. If the other team called trump, and your team took three or more tricks, your team gets 2 points. "Table talk" is considered cheating. This is when a player tries to communicate to their partner which suit should be called as trump, or any other information about their hand. Try to avoid trumping your partner unless you believe the player after you will take the trick. For instance, if Diamonds is trump and your partner leads with the Ace of Spades, it's usually a bad idea to play the 7 of diamonds. Your card will beat your partner's, but your team would have still taken the trick. However, in the same scenario, if your partner leads with the Ace of Spades and the next player (on the other team) plays the 10 of Diamonds, that player stands to take the trick. In this case, if you have a higher Diamond (and no Spades), you can play that card in order to try to take the trick. The Euchre card game can seem confusing at first, but it's easy to pick up after a couple of rounds. It's known as a game that is "easy to learn but hard to master." Once you've gotten the hang of the game and its subtleties, it can provide endless hours of entertainment.